Plants and Dogs . . . . . . . . . . . . . . . . . . . . . . . . .
Should you have poisonous plants in your garden if you own a dog? Well, lots of people do, and their pets come to absolutely no harm: but whether you personally decide to do so as well is a matter of sensible risk assessment. Within the limited confines of a garden your dog may be more inclined to experiment, and even an unpleasant taste isn't enough to deter some from a bit of unwise sampling. 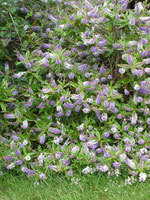 If you have a dog who is likely to nibble or chew on plants, then obviously it is commonsense that you should avoid planting anything toxic - and personally I feel that as behaviour can change and can't always be predicted, it is wise to avoid those which can be fatal in relatively small doses, such as Yew (Taxus sp), Oleander (Nerium oleander), Pieris (Pieris japonica), Sweet Pea (Lathyrus latifolius) and Lily of the Valley (Convallaria majallis). Others which are less toxic you may judge it an acceptable risk to have around - ultimately the decision is yours, based on your knowledge of your dog. Not all plants don't need to be eaten to be harmful: some can cause problems if your pet merely comes into contact with them - Tradescantia is apparently a common source of skin irritation amongst pets. You'll find plenty of information on the internet about which plants are poisonous and which are safe for your dog: the ASPCA have a useful website HERE which has pictures of many of the plants to help you identify them. Most of the information available is anecdotal, so keep an eye out for new details: the toxicity of poinsettia, for example, has recently been revised from being potentially fatal to liable to cause gastric upset. Following the principle that anything which is harmful to us is also going to be bad news for your pet is a good guide - but you should also bear in mind that not all plants which are safe for us to consume, such as onions and grapes, are necessarily safe for your pet. These bright yellow and white flowers which look like poached eggs - hence the common name - create a cheery splash of colourful groundcover that will help with pest control as they attract apid-eating hoverflies which also help pollinate plants. They are self-sustaining as they self-seed freely and will eventually naturalise themselves in patches around the garden, so a packet of seeds can be great value for money. Trees can provide a focal point in the garden, but it's important to make the right choice. Research the eventual height it will grow to, and position it with care so that it won't block out light coming into your house or cause problems with roots. Whatever the size of your garden, you can find a tree to suit - if space is limited, there are many which can be grown in pots, and if you move, they can then be taken with you. This Acer, which has done exactly that, and accompanied me through two house moves, has eye-catching feathery red foliage as beautiful and colourful as any flowers, which darkens to a ruddy bronze later in the summer. 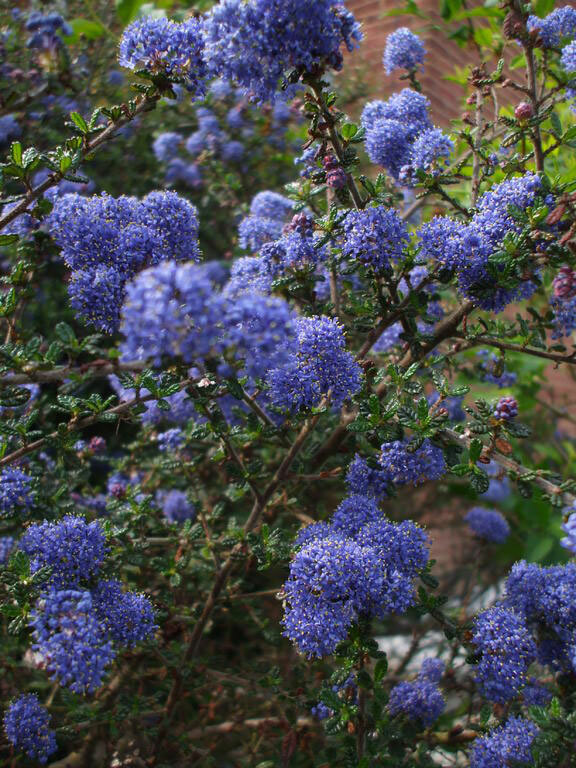 Seeing the clouds of tiny blue flowers never fails to lift my spirits; the dark green evergreen foliage intensifies the colour to an almost eye-watering perfection. And the insects love it - each year it hums with activity the moment the flowers appear. It's not the longest living of shrubs, and can be susceptible to a heavy frost, but if you have a sunny, reasonably sheltered spot, I think it's well worth the gamble. If you aren't keen on blue, varieties are also available with white or pink flowers: I'm also told that deciduous species may be more hardy. 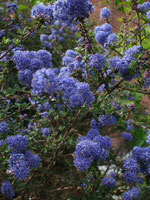 Another easy care plant, the fast growing Buddleja produces stunning displays of flowers which last 4-6 weeks. Rich in pollen and nectar, these will attract butterflies, bees and moths - hence the common nickname of 'Butterfly Bush'. The 'leek' part of the common name comes from the Anglo Saxon word 'leac' meaning a plant, so it literally means a 'houseplant' - and used to be a common sight growing on cottage roofs, where it was supposed to guard against fire, lightning and the evil influence of witches. 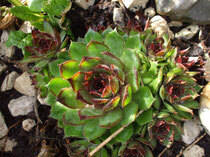 It also looks great grown in rock gardens, troughs and pots! 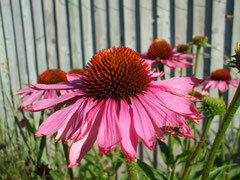 Also known as coneflowers, these plants get their name from the Greek word 'echinos', meaning 'hedgehog' - and it's easy to understand why when you see the spiky cone in the centre of the flower. What's not to love about them? They're drought tolerant (good news after the recent summers of summer hosepipe bans), don't need much attention, flower over a long period and will attract bees and butterflies. When they've finished flowering, leave the seedheads on for the birds. 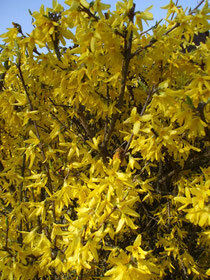 Whether grown as a single specimen, or as a hedge or screening for a fence, nothing lights up the garden on a dull Spring day quite like Forsythia; add just a little bit of sunshine and the display becomes positively spectacular. At a time of year when there's not a lot of colour around, the profusion of bright yellow flowers provide an early and very welcome splash of colour. 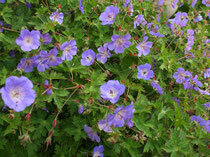 Another easy care plant, hardy geraniums (not to be confused with toxic Pelargoniums) are vigorous, with varieties available suitable for most locations. 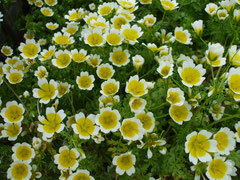 Forming dense, sprawling clumps of long lasting colour, they are perfect for helping to create a cottage garden look. 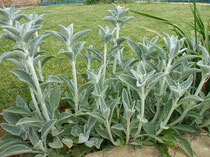 The flowers are nothing much to look at, but the foliage of Lambs Ears is irresistible - I can never pass without reaching out to stroke the soft downy leaves. A low maintenance plant which will cope well with a spell of dry weather, the silvery colour makes the perfect foil for purple flowers. 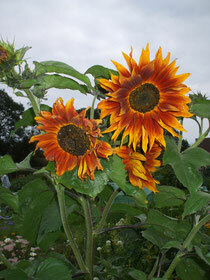 And who can resist the drama of a sunflower? Van Gogh certainly couldn't! Choose from tall or dwarf varieties - and once they have finished flowering, leave a few heads, and dry the rest,which you can then hang out during the winter for the birds to feast on - the seeds have a very high fat content. And a few plants to share . . . . . . . . . . . . . . . . . Planting some edibles in your garden as well as shrubs and flowers means you can share them in more ways than one - and many can be attractive as well as practical. As always, do your research first as some plants which are fine for us to eat can be dangerous for your pet, such as grapes and onions. If planning on eating veggies and fruit yourself, you will also need to make sure they cannot become contaminated by your dog toileting on or near them. If space in your garden is limited, and you'd like to become a bit more self-sufficient, why not apply for an allotment? There is a big demand for them these days, so there is often a waiting list, but the sooner you get your name down, the quicker you'll get to the top of it! The following are a few of my favourite plants for sharing with the dogs - and as they are also decorative in their own rights, they don't look out of place in the garden. Alpine strawberries are small and with a sweet-sharp flavour very different from the larger English types. 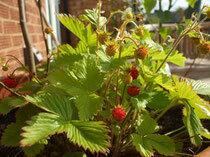 I scattered a packet of seeds on a couple of large pots and they grew with no further special attention. These are grown especially for the dogs, who always check every time they pass to see if any are ripe - they produce fruit right through to October. I love blueberries - it's lovely to have a handful scattered on top of breakfast cereal, baked in muffins or made into jam, and the dogs relish a few berries as a treat too. They also freeze very well if you have any surplus! 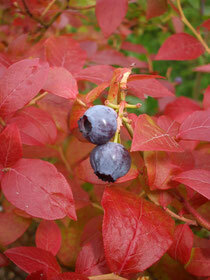 As well as the fruit, the foliage of some varieties can be quite stunning in the autumn, and worth growing for that alone. They like acidic soil, so mine are grown in tubs; so as not to waste any space, beneath them are cranberries which are also acid-lovers - and the jewel-like berries in autumn also look fabulous as well as tasting good when made into sauce. Nasturtiums are wonderfully versatile - easy to grow, they will rapidly scramble up fencing, act as groundcover, or create swags of colour tumbling out of hanging baskets or wall mounted containers. 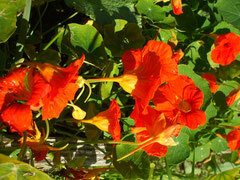 The colours are glorious, plus both leaves and flowers can be added to salads. Angel especially likes to nibble on the peppery tasting leaves. It's amazing what you can grow in a hanging basket too - try cut-and-come-again salad leaves, cherry tomatoes and strawberries. 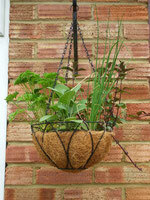 Last year I planted up this basket with a selection of herbs, and then hung it by the kitchen door. It quickly filled out and within a few weeks I had a fresh supply ready to hand, and which was well out of the reach of the dogs.